Kenrich Electric AV outfits new location for five-star restaurant with High Definition Distributed System (HDDS). Five-Star rated restaurant Mahogany Prime has moved into the new South Tulsa, OK shopping area. The upscale steakhouse relocated and upgraded its sound to suit the dark wood traditional decor and fine dining experience. Wanting to compliment the decor with a sound system comparable to the upscale decor, an ISP Technologies High Definition Distributed System (HDDS) was installed. Instead of the typical 70 volt system that most restaurants install, the patented High Definition Distributed Systems consists of loudspeakers that are amplified in each cabinet. This results in a user-friendly system that enhances the ambience of any venue. With ceiling loudspeakers, ceiling subwoofers and wall mounted loudspeakers all controlled with one unit that runs up to 5 zones. 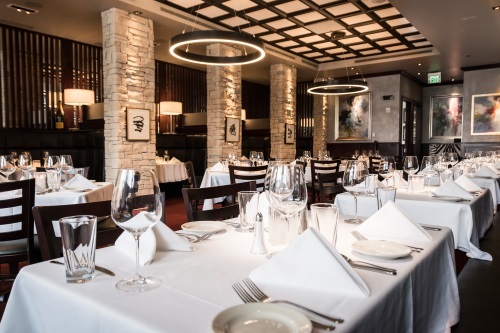 Installed by Kenrich Electric AV, Mahogany Prime Steakhouse was outfitted with 32 ceiling loudspeakers which included 24 of the higher fidelity CS654’s as well as 3 ceiling subwoofers. To compliment the ceiling loudspeakers, 9 SM652 wall loudspeakers with 4 SB112 subwoofers were also installed. Two MC1000 control units were installed to control the multi zones in the restaurant for seamless coverage. Utilizing 5 unique RM22i remotes, 5 separate dining areas can be used as independent spaces with their own audio source making for a more personal and intimate dining experience. “Our new Mahogany Prime Steakhouse relocated to a new space with a modern energetic decor featuring dark woods, expansive bar area and four private rooms so we could continue to cater to our guests ever growing needs. We recognized the need to upgrade the sound system to interplay with dining to produce a richer, fuller and distinct music experience for our guests. Mission accomplished,” says Hank Craft, chief operating officer of Hal Smith Restaurants.